The entire world wide web is loaded with online shopping spaces and one of them would be e-commerce websites. Where users may get tons of shopping categories online to peek a search on. Moreover, as we all know that online shopping has gained a lot of appreciation in the past as well as the recent days through just a smartphone and an internet connection. On the other hand, ecommerce and e-business are the two most important network that are there to fill in the gaps of our needs as well as wants. 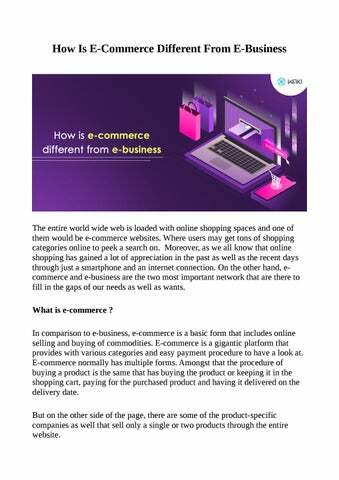 What is e-commerce ? In comparison to e-business, e-commerce is a basic form that includes online selling and buying of commodities. E-commerce is a gigantic platform that provides with various categories and easy payment procedure to have a look at. E-commerce normally has multiple forms. Amongst that the procedure of buying a product is the same that has buying the product or keeping it in the shopping cart, paying for the purchased product and having it delivered on the delivery date. But on the other side of the page, there are some of the product-specific companies as well that sell only a single or two products through the entire website. Online shopping mainly includes products that are books, electronics, clothes, movies as well as digital products like music, movie, etc. E-commerce has also made our life easier through its great assistance. Moving on to, What is exactly e-business and what are its types ? Transactions that are done through the internet is known as e-business. Also here are some of the points that clearly defines the role of e-business. 1) E-mail marketing This is one of the most important parts of e-business because it electronically conducts business process that is marketing 2) A content management system This platform basically manages the creation and modification of digital content. It is best used for formatting and publishing content and makes us get in contact with new e-commerce portals. 3) An online system is there to track inventory There are online systems to track inventory that are also known as inventory management software. E-business is growing its area between small scale and large scale businesses, therefore giving e-commerce portals a light to expand its availability. Types of e-commerce 1) Business to business It refers to a business that is there between companies. When an owner is selling his business that may include a product or the entire share to a business that exactly refers to a business to business. Retargeting your potential customers is again a key to sales strategy. 4) Long term growth It provides with great growth plus it also has a good future while you are setting up a new business. 5) Choosing the right technology Usage of the right technology is one of the core challenges that is included in ecommerce and e-business both. 6) Competitor analysis Targetting the correct audience is very important and if it is already done by the competitor then that is a thing to worry, so analyzing the competitor voice or plan of action is very important. What is the future of e-commerce and e-business Since technology and commerce are going hand in hand, also e-business as a broader space is expanding its value and worth in the market there are various things that includes sites, features, business models, strategies which follow the instinct of a buyer or a seller. Technology is clearly supporting e-commerce and e-business with all the relevant tools. Nearly all retail growth is driven by ecommerce and tracking for customer information with real-world experience is what that will lead the future. On the other side businesses mainly work with a proper plan and idea that enhances the e-commerce chain. 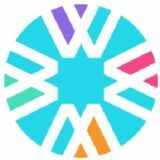 In conclusion Waki is again a fresh e-business that has made its niche in the market. Moreover, it has a chain of product for all type of customers. For more information visit Waki's website.